Often enough I get ladies in the store looking for a last-minute dress to wear to a wedding. I'm the opposite, I'm looking for a last-minute wedding so I can wear a dress. My friend recommended putting out an ad on Kijiji (like Craig's List...) advertising as seat-filler for weddings. I'm not sure it will work; your mother guilting you into inviting her third cousin's hair dresser is seat filler enough. We actually did have a wedding when I wore this dress but if there had been no wedding, I would have worn this to do a post office run because I was just so excited to take it out. I made a deal with myself to sell one of my party dresses in exchange for taking this one into the fold (AKA the closet). Making a trade is a big decision but I'm pretty sure this one is an upgrade over almost everything. I love the forest green with the bronze lining popping through and the velvet roses scattered on the skirt. I almost gasped aloud when I saw this picture in my blog feed. STUNNING! This color is MADE for you! You remind me of a princess and I love it and I want that necklace! GORGEOUS - I would definitely take this into the fold too. It's seriously not fair how pretty you are. That first picture is stunning! This is the dress of my dreams! Wow this dress is perfection. The necklace too. What wtiger9 said. That was exactly my reaction. Glamour girl!!! Now THAT is the perfect reason to host a party!!! 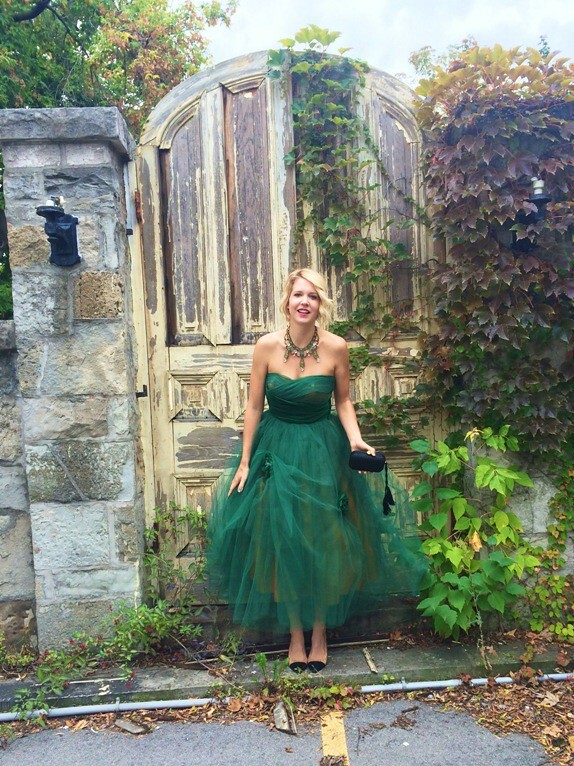 One of a kind vintage find + non traditional colors = best dress at the party every time! Everything about you is gorgeous....I WAS wondering how far you could walk in those shoes though until you mentioned that they ARE comfortable! I also gasped when I saw this photo! I just told my 10 year old daughter, who still loves princesses, that THIS would be my dream princess dress! Absolutely stunning! The color is awesome, i like it ! Gorgeous as always. Have you always had your nose pierced?! You look gorgeous in this beautiful dress! And this necklace is great. Beyond beautiful. The color is divine. That is a gorgeous dress color and photoshoot location! Awwww, stunning photos! The dress is totally amazing! Just can't take my eyes off these pics!